The early morning view from the hotel balcony is romantic; sun rays are breaking through the clouds promising better weather for today. We stay at the Enkelana hotel that is a former communist place, large and cold. The breakfast is very sober with dry bread and coffee from the thermos flask. But then the waitor is kind and brings me an espresso from the coffee bar downstairs. Hoxha had owned a villa in a beautiful park, an hour’s foot walk away from Podgradec. It is now a public park. 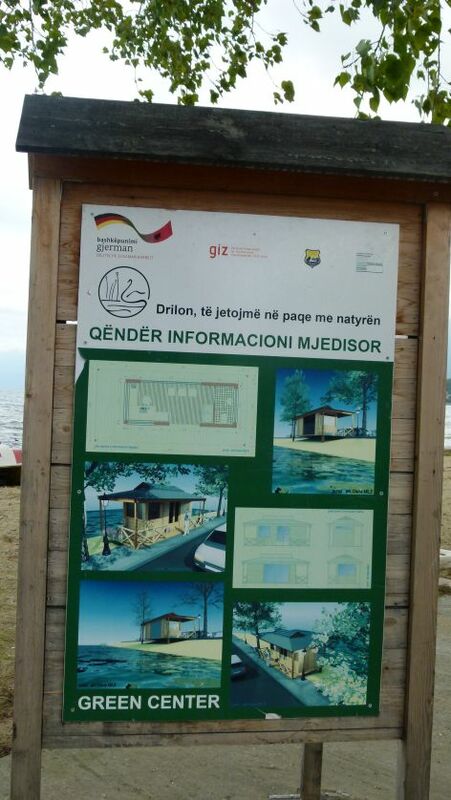 We walk to that park, along the lake Ohrid. 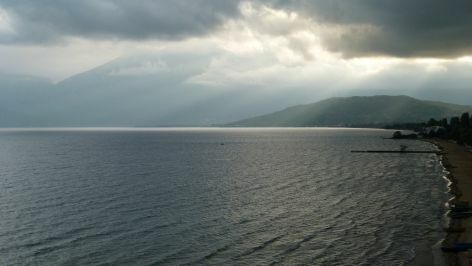 The lake is a fragile eco system with endemic species that have survived for millions of years. 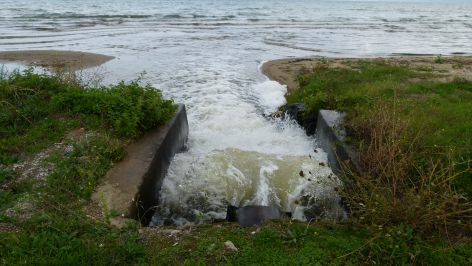 I am shocked to find this tube letting sewage water into the lake, and at a high speed. Not far from here is the “green center” from Germany. I hope they look into the sewage problem that is just 20m away from their stand. 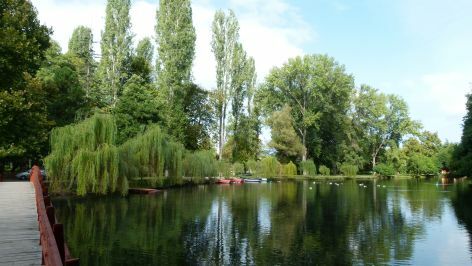 The park of Hoxha makes a nice walk along ponds with ducks and swans and between weeping willows. Hoxha used to hunt here and additional ducks were provided, if needed. 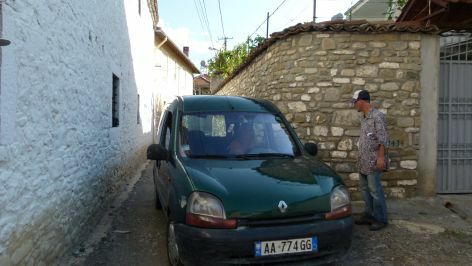 We next start our journey back to Tirana following the Ohrid lake on the west side and then climbing uphill. 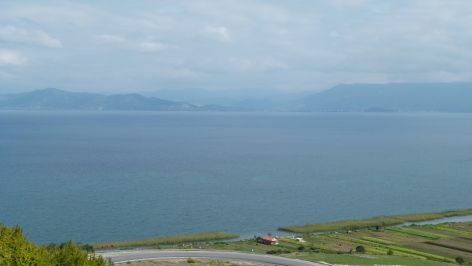 We look back at the lake with Ohrid in the distance and say good bye – mirëu pafshim. The border to Macedonia is about 4km away. There is a field with about twenty mushroom bunkers built by Hoxha. We cross the Jablanica hills and follow the river Shkumbin on the tracks of ancient Via Egnatia from Rome to Istanbul. On the border of the Skumbim river, we stop at the Gjahtari restaurant. “Gjah” means “prey” and “tari” means “hunter” I am told. I also learn that “Gjah” is pronounced “DjaH” (the “h” is said, Albanians pronounce every letter). The restaurant is large and well visited. We eat Pershesh: This is chicken on bread with intestines, all prepared in an earthernware pot that arrived at the table sizzling. 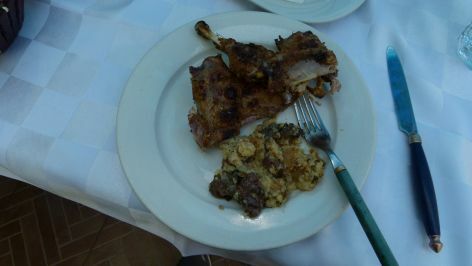 The chicken was very crispy and tasty. The name of the river Shkumbin means “falling foam” in Albanian, when I understood this correctly. Elbasan is quite a welcoming town. 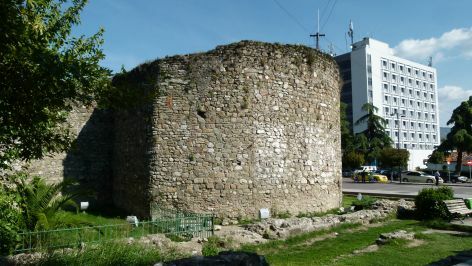 The old city with its narrow streets hides behind the town wall. 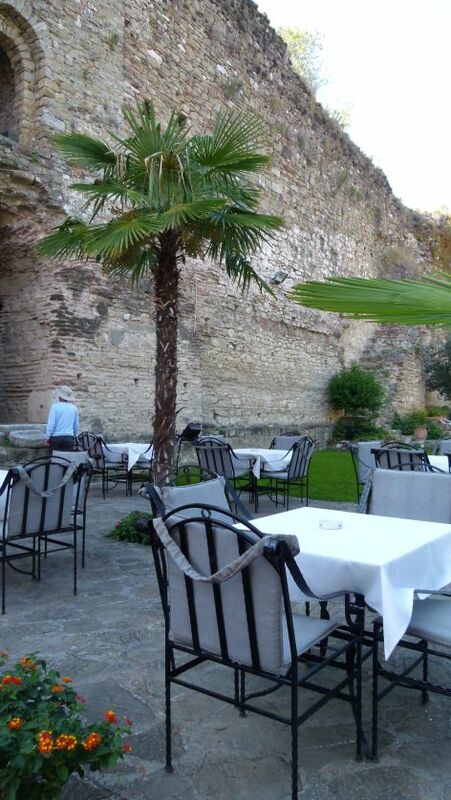 Behind the wall, we find a well kept restaurant for Turkish coffee. The garden is absolutely perfect, with flowers, bushes and trees, all well trimmed. A talented gardener has architected it. This is St. Mary church. 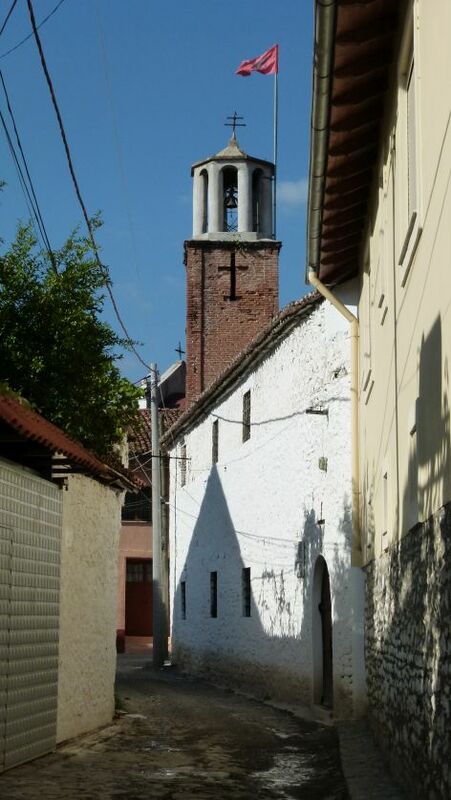 The Albanian flag is on top of the church tower. Ben wants to introduce me to the priest that refuses to report into the patriarch of Greece, but the gate is closed. 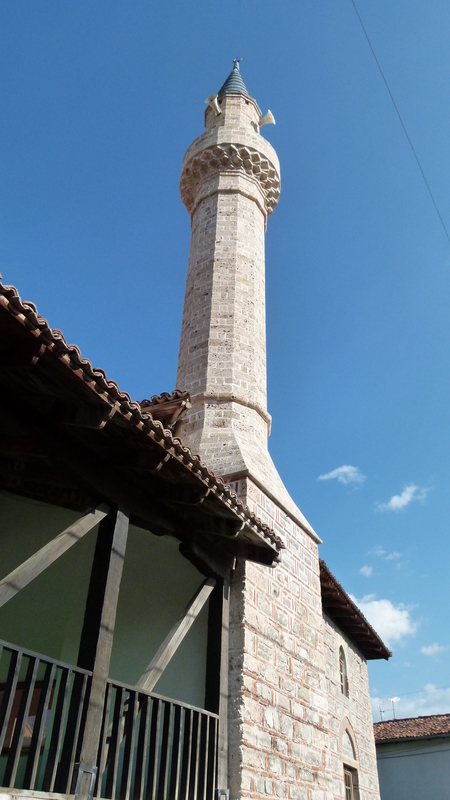 The mosque of Elbasan has been built in 1417. 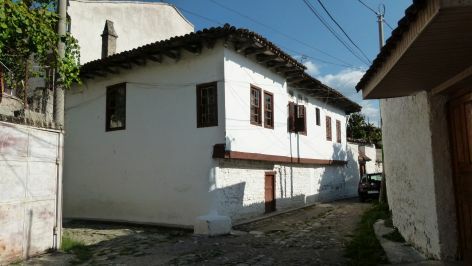 It is the oldest mosque in Albania. The Ottomans were only able to conquer the north of Albania after Skanderbeg’s death (1468). The mosque is closed and being renovated. … carefully watching out not to be overrun by cars that are allowed here. 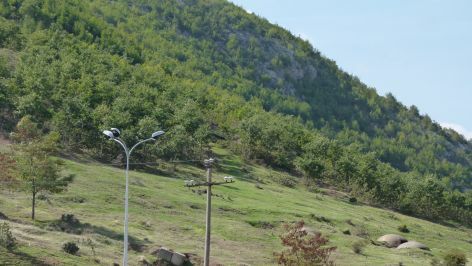 A motorway will connect Tirana and Elbasan, and it is partially ready. 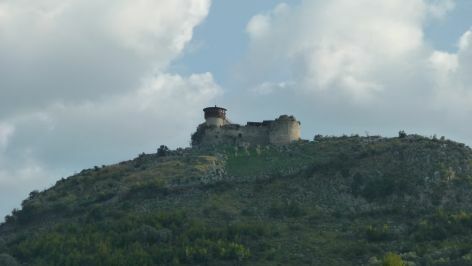 On the route we see the Petrelë castle that had been held by Mamica, the favorite sister of Skanderbeg – she was a brave supporter of his resisting the Ottomans. 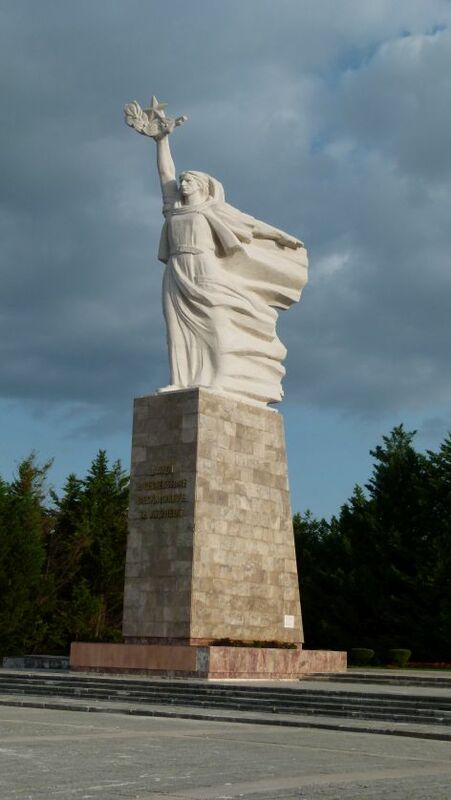 Before we enter Tirana, Ben stops at the statue of the Mother Albania. She guards over Tirana. 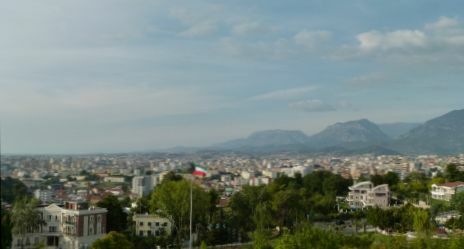 We enjoy the view saying hello to Tirana, where my round tour through Albania will now finish. The 19 days were wonderful. We complete them with a dinner at the apartment of Ben’s family. His wife has prepared a delicious pite, yoghourt and sweet milk rice as a dessert. The one year old son has yoghourt and byrek in his face and looks very happy. So am I.